Are Back Bends & Forward Bends Opposites? Forward extensions and backward extensions feel very different. Not only physically but they have distinct affects on both my mind and mood. To me, backbends feel like an extroverted practice while forward bends feel introverted. Backbends are energizing and uplifting, while forward bends are contemplative and soothing. In the early days of practice, for most students, forward extensions are quite difficult. And while most people do find that (eventually) forward bends have a quieting affect on the mind, in the beginning they are often a struggle and therefore not particularly ‘quiet’. Think tight hamstrings and a stiff pelvis. Pretty much all you will accomplish with such a forward bend is a sore back! The Iyengar’s actually teach that in order to do a good forward bend, you must first find the backbend in each forward bend. What does that mean exactly…? It means that you seek out a concave action in your thoracic back before extending yourself forward. My teacher, Senior Iyengar Yoga Teacher Marlene Mawhinney distinguishes between a forward bend and a forward extension. She says bending forward is exactly what it sounds like, you just come forward. A forward extension, however, is when you maintain the length of your side trunk that you achieved in the concave position as you come forward. A certain degree of rounding will inevitably occur but effort is made to extend forward equally and maximally. This is a typical Iyengar Yoga sequence used to teach how to lengthen the side trunk before extending fully forward. This is my attempt at keeping the side trunk long as I extend forward. You can see pretty clearly the spot in my upper back where I get ‘stuck’ and lose the length in the side trunk. Okay, so I’ve pretty much explained why practicing simple back extensions might help my forward bends but why then was I practicing forward bends to improve my back bends??? When it comes to bending backwards it’s not uncommon for people to think it’s all about the arms, shoulders and strength in the thoracic region. 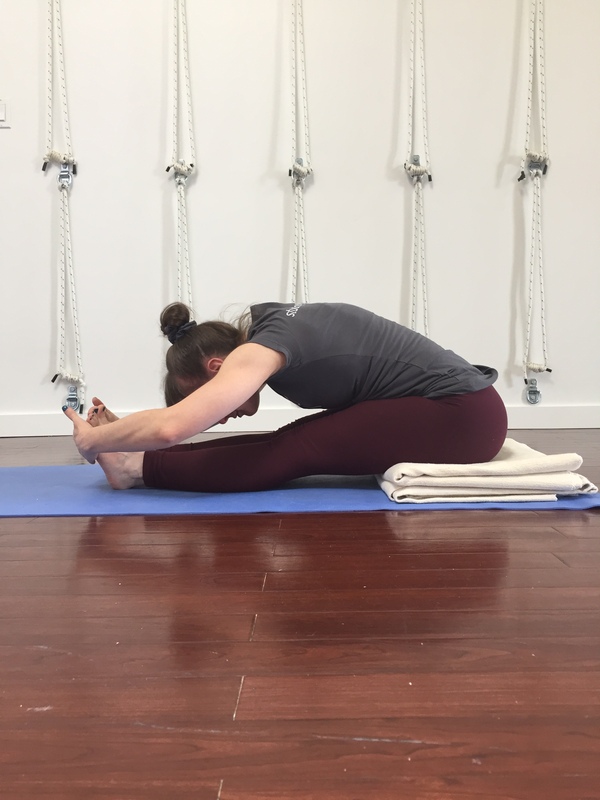 While all of these things are certainly important, what is often forgotten is the significance of the legs and groins in a proper, safe, and solid backbend. In this video, you’ll see me practicing a variation of Dwi Pada Viparita Dandasana with a chair. 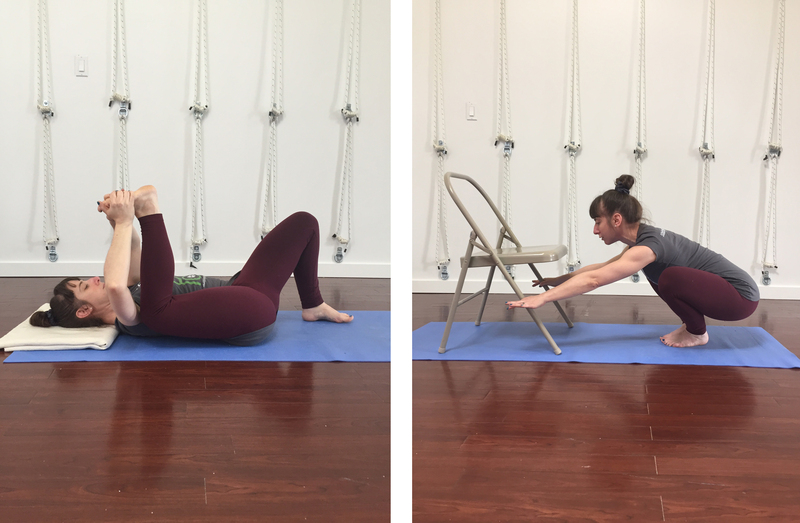 With more than a decade of consistent yoga practice under my belt, I’ve managed to get some opening in my chest and with the help of the chair I’m getting some shape to the head end of my backbend. The leg side, however, is…a mess, which brings me to practicing forward extensions with the intention of improving my back extensions. When I arch back, I lose control of my legs. My thighs want to splay open and my inner groins get hard and pop up. Of course I ‘try’ to communicate the correct actions to my legs (press inner foot, roll front thighs in, soften inner groins, etc.) but the truth is, at this stage in my practice there isn’t much visual proof of my efforts :). However…in my forward bends, I have some control. I can communicate these same instructions and actually ‘feel’ that something is happening. I guess I figured if I am successful at softening my groins in my forward extensions, eventually, I’ll be able to translate that ‘intelligence’ to my back extensions. Here are a couple of examples of poses I did with the intention of softening my inner groins. BKS Iyengar is known to have said that if you have a ‘bad’ side, you have to let your good side teach your bad side. This maxim has always resonated with me. My ‘good’ side gives me a taste for what an action is supposed to feel like, for the sensation of ‘intelligence’ in that region, and then I can better seek it out on the other side. In this case, I intuitively felt that my forward extensions have something to teach me about my backbends. Tying this back to my afternoon practice that I mistakenly thought was going to be all about backbends, I’d like to leave you with an old Yiddish proverb (that may as well be the subtext to my life), “We plan, God laughs.” So true, is it not?!?! Major thanks to Nozomi Morimoto for making a special trip to Studio Po to take the photos for this post!!! very clearly explained. i enjoyed this post. Thanks Stephanie! This exploration of how to create intelligence in one pose to carry into a seemingly opposite pose was one theme of Zubin’s teaching at the convention this past weekend. Your article adds another piece to this vast puzzle. Thanks Glenda (it’s nice to hear from you!) I enjoyed seeing all of the photos from the conference. It looked very rich. Wish I could have been there… Hopefully next time :).